On Thursday 21 June, I will be sleeping at the Cbus Stadium as part of the Vinnies CEO Sleepout® 2018. Why? 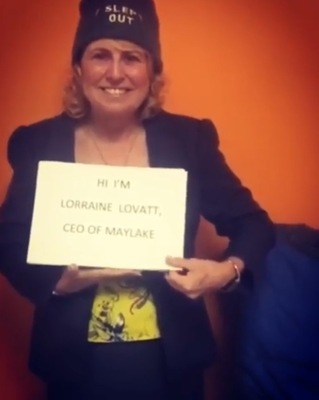 As an CEO Sleepout Event Ambassador I want to help bring the issue of homelessness out of the shadows. 105,000 Australians everyday people like you and me experience homelessness every night. This is devastating, particularly when you learn 27 per cent are children. Homelessness has many faces. The reality is often quite different from what you might think. Australians believe 10% of our homeless population are women. It's actually 44%. A donation of just $50 can provide warm blankets and a meal to someone facing homelessness, and $100 can keep a family's power on this winter. This year I am aiming to raise $25,000.00 To get there, I need your help. Donations are tax deductible and can be processed online. This year Maylake will be matching ALL of our tenant's donations, DOLLAR for DOLLAR! And remember all donations over $2 are tax deductable. Your generous donations will not only provide immediate and emergency assistance but pathways to a brighter future. Don't forget Maylake will be matching our tenants generous donation DOLLAR for DOLLAR and all donations over $2 are tax deductable. TO VIEW | Click the photo below to watch my personal message. I Thank you for your support and will keep you updated of my fundraising progress and let you know how the event goes.